Tourism and Rajasthan go side by side. As you take a tour of Rajasthan with us, you will explore so many new facets of Rajasthan. Whether it is the sand dunes or the massive forts and palaces, you will realize that there is no other place like Rajasthan. For a traveler who is interested in the history, culture and the lifestyle of the people of the Oriental world, Rajasthan is just the perfect tourist destination. Unlike what its barren scenery suggests, you will find that Rajasthan is the most colorful and interesting place inhabited by humans. An exotic land, a dream come true for the Western world, Rajasthan was home to the Rajputs, the martial races of India known equally for their love of arts and architecture as well as valor and chivalry. Tourism opportunities in Rajasthan are immense. 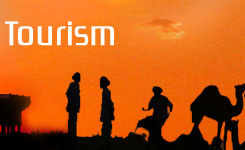 Rajasthan tourism offers a great variety of tour & travel experiences. Whether it is sand dunes, Desert safari, forts and palaces, the colorful tribal life or the fairs and festivals of Rajasthan, travelers to Rajasthan are assured of a truly regal experience. Come and explore the rich cultural heritage of Rajasthan yourself.